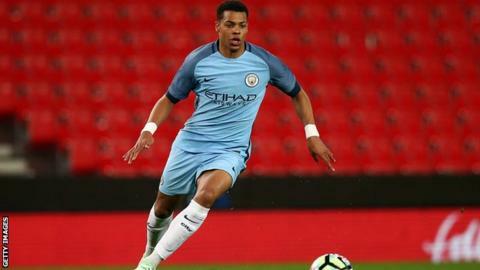 Lukas Nmecha scored a 93rd-minute winner as England beat the Czech Republic 1-0 in Tbilisi to reach the European Under-19 Championship final. Manchester City's Nmecha finished with an audacious back-heel from close range after combining with Tottenham's Marcus Edwards, with both players on as second-half substitutes. Keith Downing's side face Portugal in Saturday's final in Gori, Georgia. It is the fourth final reached by an England youth team this summer. Last month, England won the Under-20 World Cup by beating Venezuela 1-0. In addition, they won the 2017 Toulon Tournament in June, and reached the final of the European Under-17 tournament in May. England were also semi-finalists at the European Under-21 Championship in Poland last month before losing on penalties to Germany. It is also the third European Under-19 Championship final reached by England, having lost to France in 2005 and Ukraine in 2009. Portugal beat the Netherlands 1-0 in Thursday's other semi-final.